I hope you all remember the travesty that was the “Have you tried Radicchio?” adventure. I know I can’t forget it. So, when faced with yet another new lettuce-type substance, I was nervous. As far as I know, I had never tried escarole and I knew I couldn’t trust EF for saying it was delightful. I’d fallen for that one before. It looked ok, it smelled ok, but I took my first bite with great trepidation. But guess what! EF didn’t lie to me!! 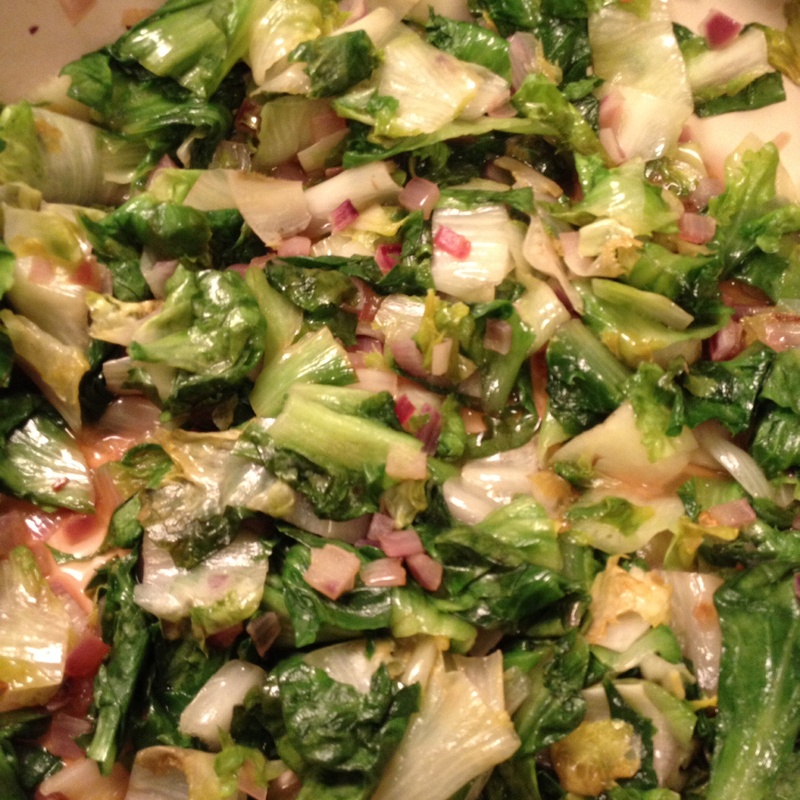 Escarole is delightful. It was green and yummy and something about it vaguely reminded me of artichoke (and let’s face it, that’s never a bad thing!). The recipe was super simple and took approximately 5 minutes to cook. I suggest you keep this on the back burner for any night you need a quick and healthy side dish. All packed up to go to Book Club. This recipe is super simple. I just tossed everything into the food processor and I had my dough within seconds. Literally. However, this recipe made me realize two things. Number one, I need to upgrade to a new zester, rasp, whatever you want to call it. The one I have was sent to me as a gift for renewing my Everyday Food subscription many years ago. It probably wasn’t great to begin with. Now, it just needs to go. Time to upgrade to a microplane. Second, I need to upgrade my baking sheets. I’ve had them for close to a decade and used them continually. It’s time. It’s also time because for some reason one of the pans I was using made the bottom of these cookies super dark, despite rotating the pans in the oven. The cookies themselves were delicious. 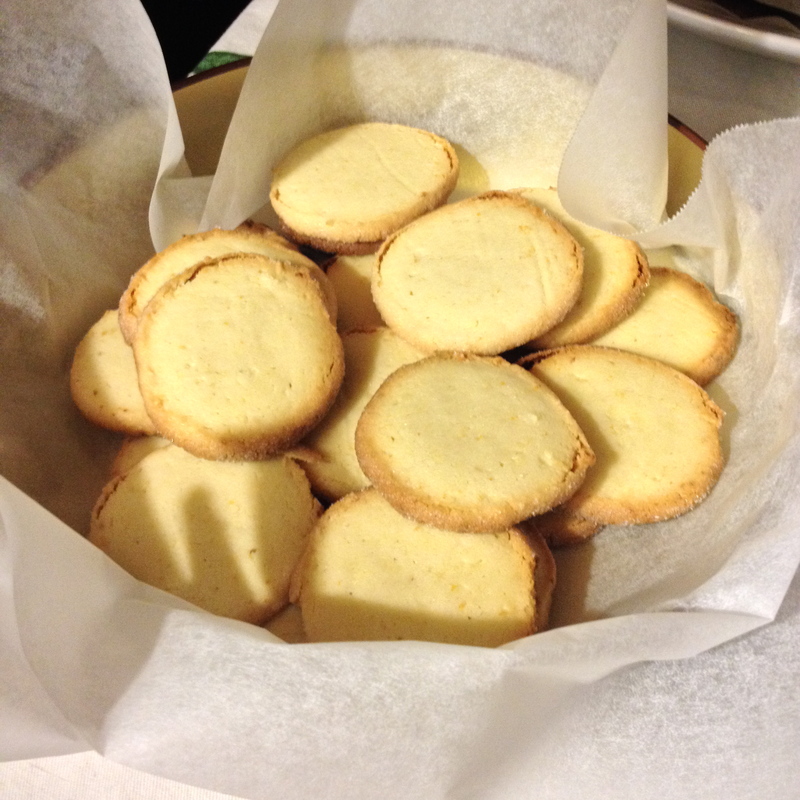 They were like a lightly lemony shortbread. Yum! They went over well with my new book club (I took them to the first ever meeting I attended.) and I’m sure they aided my acceptance into the group. And so, I’ve decided to rename them Lemon IceBreaker Cookies! Baking Sunday morning before any coffee…Recipe for disaster?? 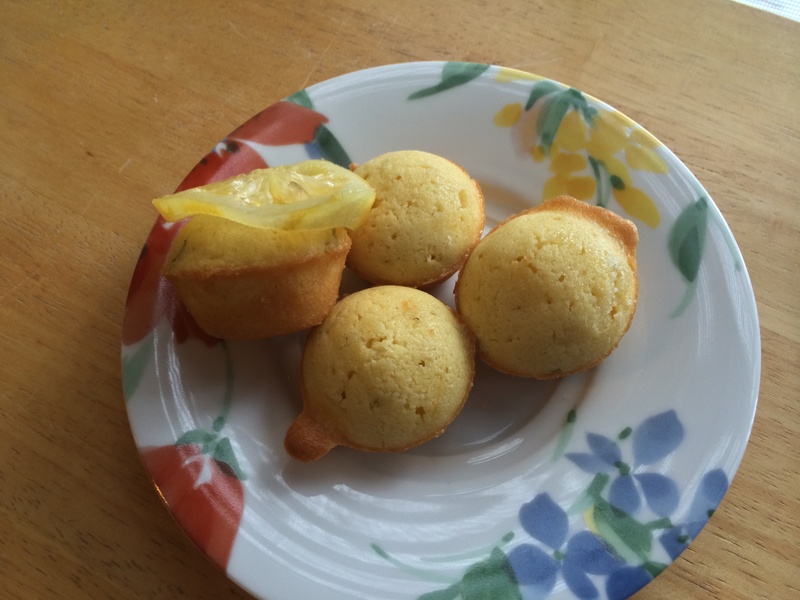 The lemon-lime tea cakes was the last recipe on my list to bake for EF’s 69th issue. I woke up bright and early (7 am) Sunday morning ready to bake! Got the coffee brewing and then started mixing the ingredients for the tea cakes. 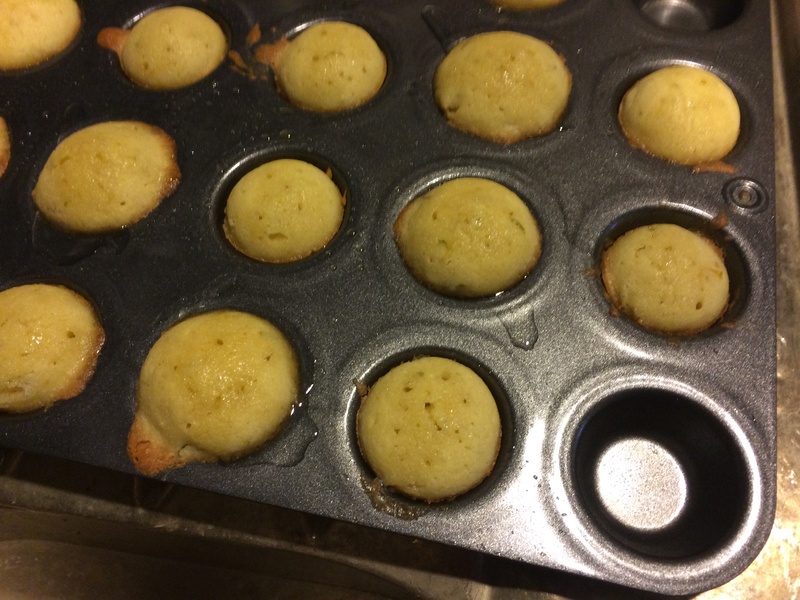 Using my lovely Kitchen Aid, I combined all the ingredients, put the batter into 20 mini-muffin reservoirs, and popped them in the oven. Poured myself a cup of coffee, took a sip, and started gathering my thoughts for the lemon syrup I was about to make. 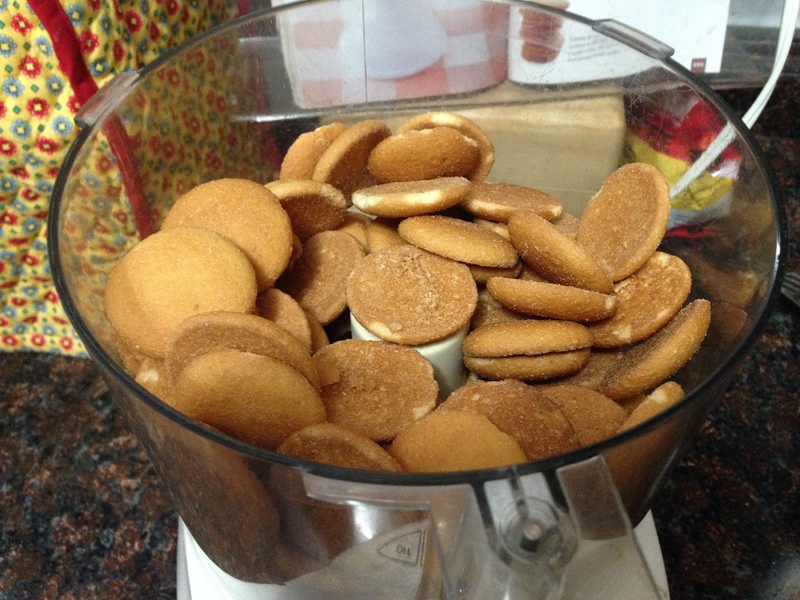 Dang…I completely forgot to put the salt in the tea cakes. I probably should have waited to start baking after I had some coffee, to let my brain wake up. Oh well, the damage has already been done…Back to making the lemon syrup and finishing my cup of coffee. The syrup took less than 15 minutes to make, so it was perfect timing. I was able to pour the hot syrup over the hot tea cakes. The smaller tea cakes soaked up the syrup better, because the syrup that didn’t soak into the toothpick holes, seeped between the cake and pan. P and I snacked on the lemon-lime tea cakes while watching ‘Meet the Press’ and drinking coffee. The tea cakes were amazing! They were like baby pound cakes with a nice burst of citrus flavor. We didn’t miss the salt one bit! I would definitely make these again and would love to try orange peel and juice. Although the lemon-lime tea cakes will be hard to beat! Baking Sunday morning before drinking coffee was NOT a disaster! 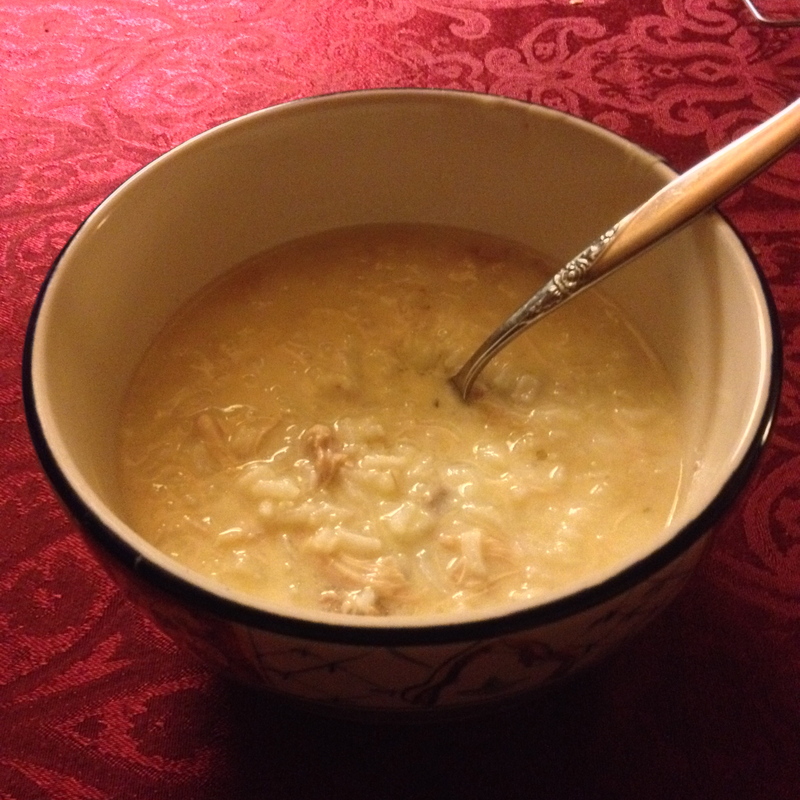 Also known as avgolemono, this soup has been a longtime favorite of mine. I’ve made several version of this Greek soup and this recipe stands up with the best of them. No matter what recipe I’ve used, this soup is remarkably simple, only 5 ingredients plus salt and pepper (I refuse to count a garnish as a legit ingredient, so the dill from this recipe is not included in my calculation). And it always tastes delicious. It is both super comforting and incredibly light at the same time. The lemon is refreshing and makes you think of the springtime. I particularly enjoy this soup in the deepest, darkest part of the winter (the short hours of sunlight in January, ugh). This recipe includes chicken breast which helps fill out the soup. I personally enjoy it even without the additional meat, but the Bear needs something heartier so this recipe actually works better for us than the other versions I’ve made in the past. I know I often tell you try give a recipe a try. But seriously, give this recipe a try. Try it during the next snowstorm, when you don’t feel like the spring will ever come and you are overwhelmed by the grey and gloom. It will make your heart happy. Seriously. The most important thing to say is that the spice mixture is nice, but a little much. 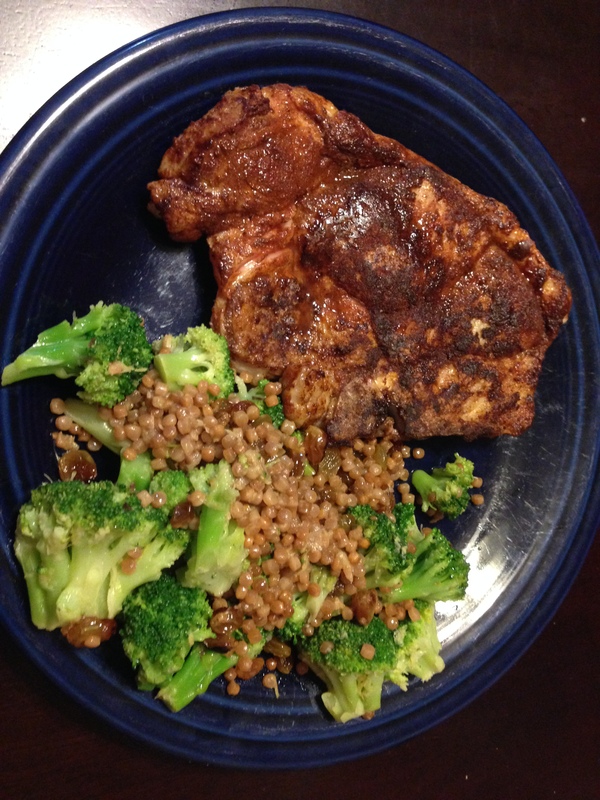 It calls for 1 t paprika and 1/2 t cinnamon…on one pork chop. That’s way too much paprika and cinnamon for one human to eat on pork. I very much enjoyed it for about 1/2 of the chop before I got tired of it. I think you can get away with spicing two or more chops with as much as it calls for for one chop. That’s how I rewrote the recipe. Also, if you’re someone who hates cinnamon on savory foods, cut way back or cut it out. Somehow, the cinnamon flavor roars through all that paprika, pork, and everything else on the plate. You’d better love savory cinnamon recipes. The couscous didn’t get fully cooked, and I should have remembered that from the zucchini fish dish. I very much loved the golden raisins in there, although I think you could get away with normal raisins. The lemon zest and juice really pulled it all together. It’s a great side with a flawed main dish. I will say that it’s a quick recipe. Plus, it only messed up two pans and one cutting board. 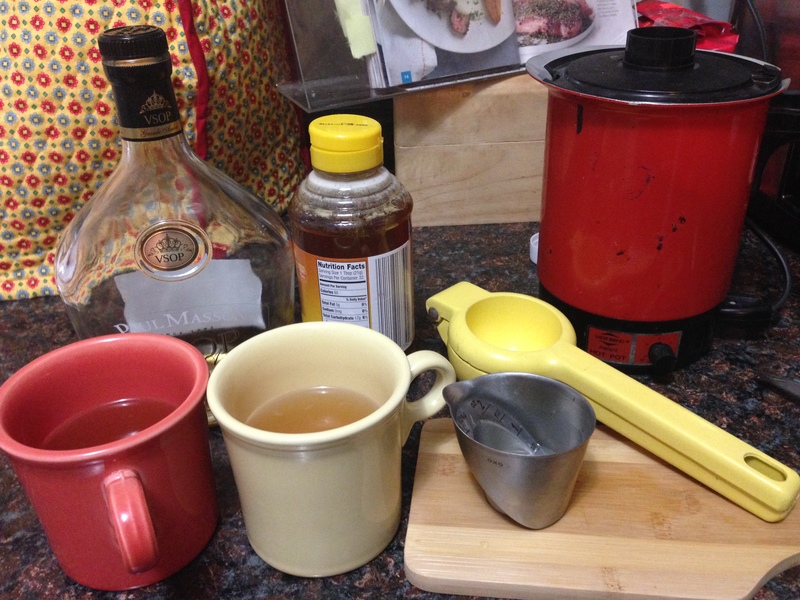 Guest post: Hot toddies, comin’ through! D here, husband to G and resident Cooking the Stripes bar-tender, guest posting for the Hot Toddy recipe from November 2007. “Make this for your holiday gathering” drink recipes are often problematic, because they only include instructions for how to make a batch for a crowd. This deters experimentation. A Tom & Jerry might be delicious, but I wouldn’t know because I’ve never happened across 30 people who want a raw-egg drink at the same time. As party recipes go, the EF Hot Toddy recipe is great, because though the top-line information says it makes 8 drinks, the actual instructions provide the precise measurements for a single, drink, so you can do one or two as easy as a party batch. A “hot toddy” is one of those things that everyone name-checks but nobody drinks. So G and I were both excited to see what a real live hot toddy tasted like. On the ingredients: don’t waste a bunch of cash on good brandy just for this. The cocktail authority over at Esquire, David Wondrich, did a feature on the best cheap booze. Print it out and save it. These are excellent, affordable recommendations to stock your home bar with. So, based on Mr. Wondrich’s expertise, we used Paul Masson Grande Amber VSOP brandy. It’s about $13 for a bottle but it way better than that price would indicate, and makes a perfect base spirit. On the proportions: The one adjustment that this recipe needs is to bump up the brandy. I like my cocktails strong, much stronger than G tends to. It’s not uncommon for me to make a new drink that I really like, and have her choke/cough after her sample sip and say, through watered eyes “tastes like burning.” (If you know G, you know that’s a Simpsons reference). That being said, even she preferred this toddy with 1 1/2 tablespoons of brandy (that would be 3/4 cup if you’re making the 8-serving), instead of the 1 tablespoon it calls for, which was a little weak. I preferred it at 2 tablespoons per mug, though few are likely to be as far at the end of the spectrum as me on this one. On the technique: here’s a pro tip. Don’t worry about trying to get the honey off the measuring spoon. Just measure your honey last, and leave the measuring spoon in the drink when you pour in your hot water. Then use the measuring spoon to stir the drink, and the honey will dissolve from the heat as you mix. Plus, no swizzle stick to wash. I really urge you to try this recipe. It’s the cocktail equivalent of an enthusiastic hug from a slightly overweight grandmother: comforting, warming, wonderful. And yes, we both had seconds. You can’t have just one hug from grandma. I, like a small minority of Americans, do not like cheesecake. I’m not sure if it’s the texture, although that doesn’t help, or the richness or what. I like cream cheese. I like cheese danish. Why not cheesecake? There is, however, one kind of cheesecake that I love. I love ricotta cheesecake. I had a wonderful slice of ricotta cheesecake from an Italian restaurant around NYU years and years ago. I think I liked it because it wasn’t so sticky as traditional cheesecake, nor was it quite so sweet. I’ve spoken with other people who feel this way. In fact, lucky me, I happened to make this dessert for a friend who had a similar experience with a, shall we say, alternative cheesecake in London. This tart is creamy and rich, but not sticky and heavy. If you’re ever thought of yourself as “not a cheesecake person,” this is the one to try before you write it off completely. A few notes on the recipe are in order. First of all, the recipe calls for a 9 inch tart pan. Wouldn’t you know it, my only tart pan is a 12 inch. Baking is way too sensitive to mess around with the size of the pan. 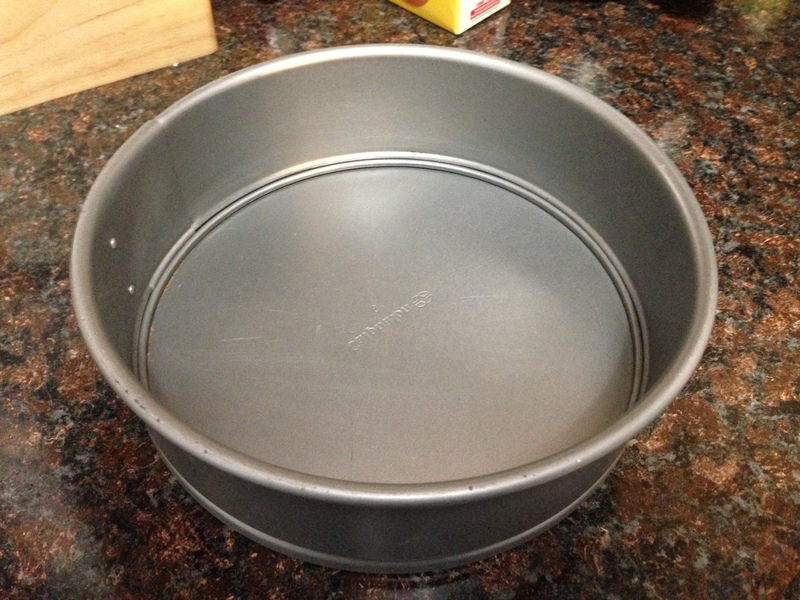 Someday I’ll have a kitchen big enough to have multiple tart pans… What I do have is a 8 or 9 inch springform pan. I thought this would be a fine substitute because it is the right size and it has the removable bottom feature that a tart pan has. 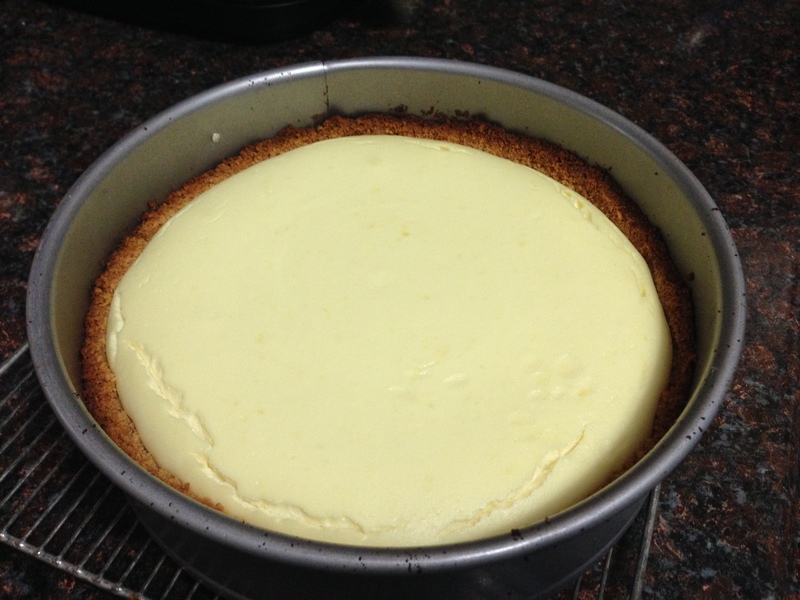 Plus, you usually make cheesecake in a springform pan, don’t you? 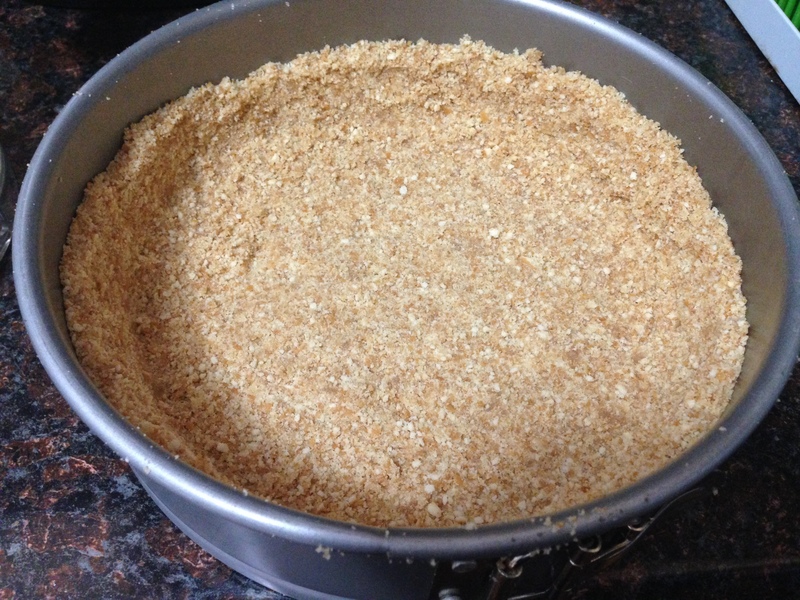 The crust is delicious and lighter than a graham cracker crust. The filling has a subtle lemon flavor and that wonderful texture. It makes for a light, but very satisfying dessert. We had it with an awesome brunch with a lot of great savory flavors (including a savory bread pudding I really need the recipe for), so this was a great way to balance it out with something sweet. I did have to cook this tart longer than the recipe said, and I think that did have a little something to do with the size of the pan. I think my pan might have been only 8 inches, and I think that meant that the crust was thicker in places than it would have been in a 9 inch tart pan. Also, my tart never browned. The recipe made a huge deal about how to cover up the brown spots. I never got brown spot one. No idea why. The tart was a huge hit. 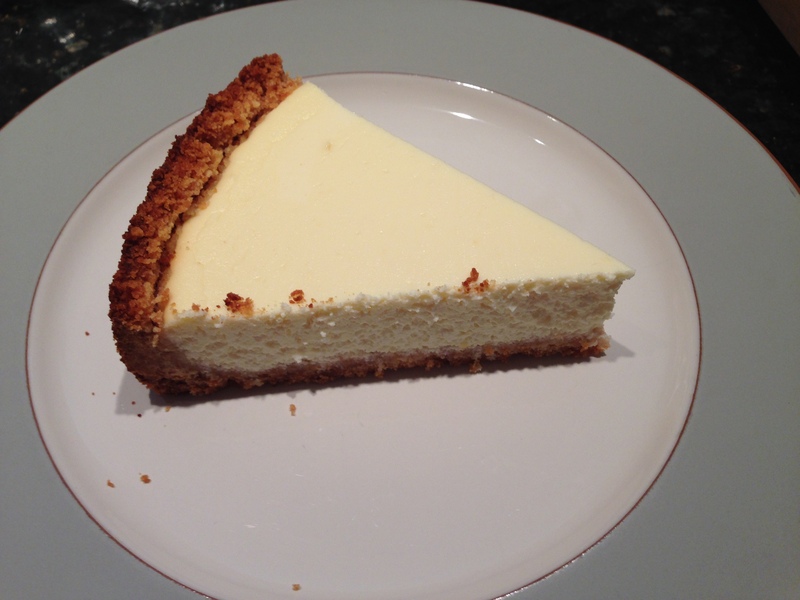 My friend thought that it captured the taste and texture of the cheesecake from London she’d been trying to find. Success! When G and I looked at this recipe we knew were going to make this a boozy version, but vodka seemed like a total copout. I’ve actually had good luck with Martha Stewart’s cocktail recipes in general and the Everyday Food “Happy Hour” section in particular. The Happy Hour is where I first discovered the way to make a proper Lemon Shandy which is kind of a curse, because once you’ve had it you’ll never be able to drink any pre-made “shandy” type beer again. The “Happy Hour” is also where I was introduced to miracle that is Tequila & Tonic. It’s 5,000% better than you’d think it is – trust Martha on this one. Throwing vodka in this just seemed uninspired, so we decided to have our own tasting to audition the best spirit to add in here. The first that we tried is white rum – we used Flor de Cana 4 year old, because that’s what I had on hand. It was serviceable, but the flavor of the rum didn’t really come through, and the whole thing just kind of ended up tasting like a wan beach drink from a TGI Fridays. Since we jettisoned the suggested vodka in search of something more flavorful, this wasn’t what we were hoping for. Next we tried it with a silver tequila, in this case Leyenda del Milagro (at about $20 a bottle a phenomenal value if you can find it). This was decent, but something was missing. 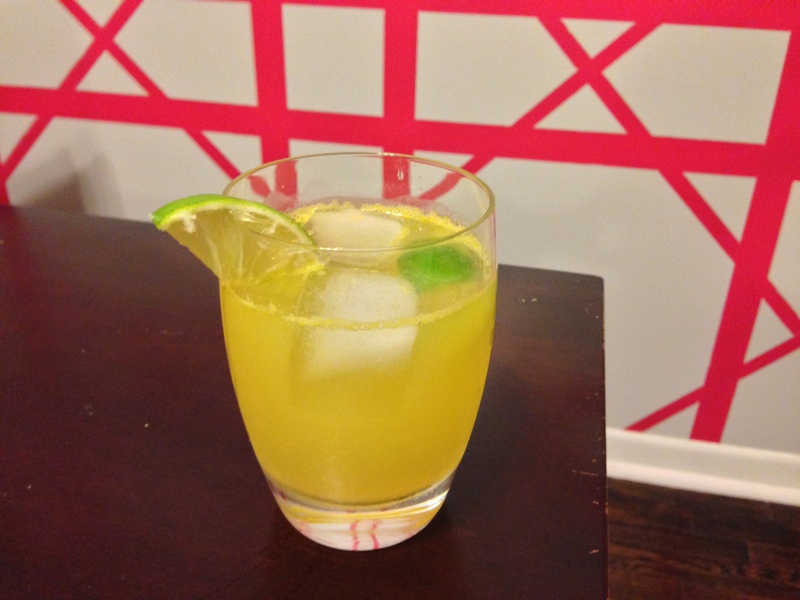 The tequila/lime/orange flavors made it very similar to a classic margarita, but the addition of the lemon and the effervescence of the club soda made the whole thing kind of odd: it ended up tasting like someone had poured 7Up into your margarita. Surprisingly, the white rum was actually better. Two other things to note before declaring the winner. I drug the bottle of Tanqueray out of the freezer mostly as a lark: huge mistake. Imagine a band doing a cover of the Snoop classic “Gin and Juice” in Spanish, and then imagine resulting song as a cocktail. Horrible. 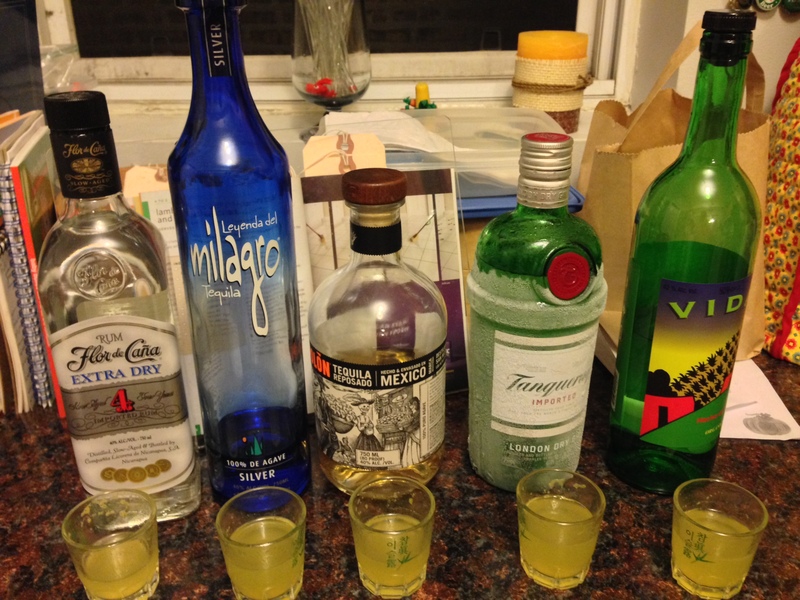 Also falling into the “bad idea” category was mescal (far right). If you know what mescal is and like it, don’t waste your time here – the spritzer base is too sweet and clashes with the smokiness of the mescal. If you don’t know what mescal is, now is not the time to learn. Move along. So the winner was a reposado tequila. Tequilas generally fall into three rough categories: 1) silver or “blanco” which are not aged or have been aged only slightly, 2) reposado tequilas, which have been aged between 2 months and a year in oak barrels, and 3) anejo tequilas, those aged over a year. Like aged whiskies, tequilas take on a woody, smoky character from the wood in the barrels, and the bite of the alcohol tends to mellow. Anejo tequilas run to the pricey side, and generally should be sipped on their own. But there are excellent reposados available at reasonable prices if you know what you’re looking for, and they can be just what a cocktail calls for. Reposados tend to be much less smoky than a mescal, so they can be easier to mix and more crowd pleasing than a mescal cocktail, which is often an acquired taste (G has yet to acquire this taste for the most part). Espolon is fairly widely available and their reposado tequila is an inexplicably good value at about $23 a bottle. I think they just break into other distilleries and steal this stuff or something. Go track it down and mix it into your spritzer (and your margarita the next time you make one). The aged character comes through just enough to give the drink some character, but it doesn’t overwhelm the base: the fresh sweetness and the acidity of the juices still comes nicely into balance. The seltzer gives the whole thing an effervescence that makes these dangerously easy to drink. Even G, whose tolerance for smoky alcohol is about 1/1000th of mine, declared this one the clear winner. So go get yourself some Espolon Reposado and have a couple of these. We still need a name for this magic elixir, so get drunk and suggest one in the comments. When I saw the recipe for Lemony Baby Broccoli I was pretty excited! I serve broccoli with lemon often and I was looking forward to kicking that up a notch with this recipe. Garlic only makes things better right?! And yes, it was good. Very good. But I don’t think it gained anything from the fact that it was baby broccoli. And it actually only increased my expectations because that darn baby broccoli was $3 for a tiny little bunch! I could have bought a lovely head of standard broccoli for less than that and had basically the same outcome. I think I probably will make this again but I won’t go to the trouble of finding the baby broccoli, the standard stuff will do just fine! 1 large head broccoli (about 3 pounds) with the leaves yanked off. cut into florets with the stalks coarsely chopped. Saute the onions in the oil over medium until soft, roughly 5 minutes. Season with salt and pepper. Add broth, broccoli, potato, and 2 cups water. Season with salt again. Bring to a boil. 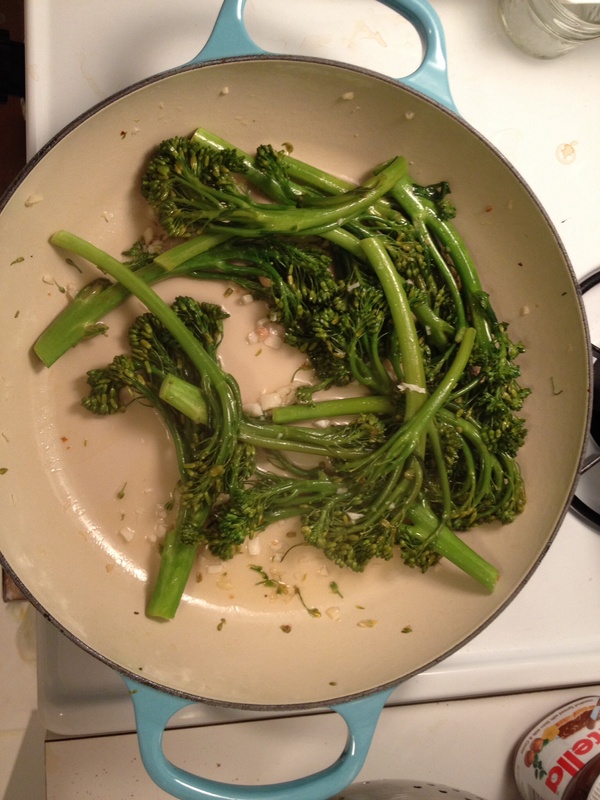 Reduce heat and simmer until broccoli and potato are tender, about 4 minutes. Working in batches, puree soup in a blender and return to pot. Remember not to overfill the blender jar, and do the towel over the blender lid opening trick to keep the hot soup from exploding all over. Stir in cream and lemon juice, season again. Have you ever been relieved to throw food out? I hate to waste, so I rarely throw things away unless they’ve gone bad. This soup was an exception. Let me begin by saying everything that was right about this recipe. It’s a “Freeze It” recipe. I love those recipes. Of all of my EF go-to recipes, most of them are Freeze It’s. I like having some buffer in my meal planning, so I don’t have to pick from three choices: cook, order in, or heat up a frozen pizza. The beauty of a Freeze It is that it’s as good and wholesome as cooking, but as fast as heating the frozen pizza. So this recipe had that going for it. Also, it’s cream of broccoli soup. When has that ever not been good? Not that I can remember. I was somewhat suspicious because this is not cheese and broccoli soup. Obviously, cheese improves all soups by a power of…let’s say five to be on the conservative side. Well, as long as we’re playing the hindsight game, the recipe also had a note saying “Just a small amount of potato and a whir in the blender make soups smooth and rich-tasting, so you can get away with using less cream.” Potato + air = cream. Interesting…. So it should have been a creamy, yummy, freezer-friendly recipe. What it turned out as was an oddly sour and thin soup that was thrown away soon after eating. 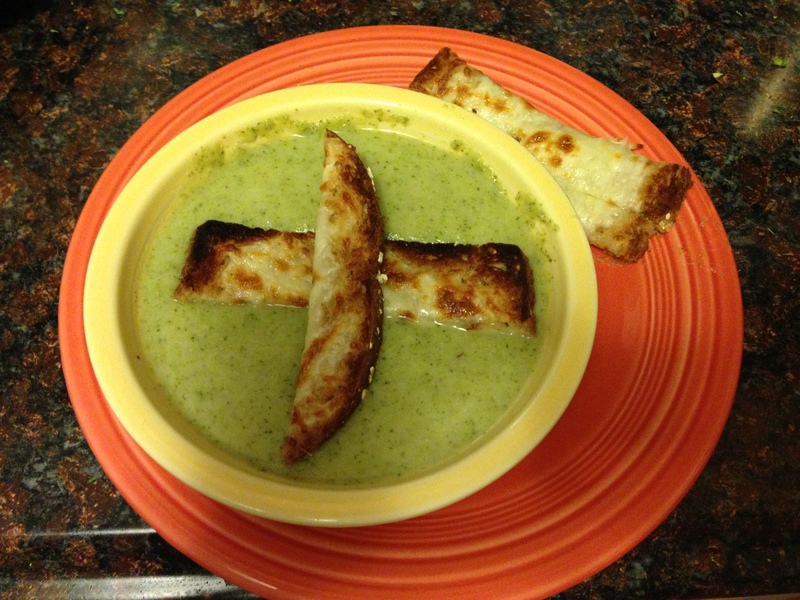 The pieces of bread you see on top of the soup were my own addition. I figured if cheese would have made the soup better, then I could add cheese to the top. Plus, cheese toasts would give us something to dunk. And I like bread with soup. The cheese toasts were the best part of the meal. I toasted pieces of wheat bread, threw some grated Swiss cheese on top, and put them under the broiler for a couple minutes until they were melted. The toaster and the broiler? Yeah. I don’t trust my broiler not to burn things, so I try to use it as little as possible. If I had a toaster oven, I would have used that. Back to the icky soup. Where did it go wrong? Some theories: Theory 1: I used homemade veggie stock and it was too rich or intensely flavored for the soup. The stock itself was very robust and flavorful. If you’re at all curious, here’s a good post on how to do it. I got the recipe from this amazing book, The Urban Homestead. It’s also where we got the homemade yogurt recipe. You know how usually veggie stock doesn’t taste like much of anything? This tasted like earth and roasted veggies and strong coffee and going to see a man about a horse. I think it’s possible that my brawny stock was too much for cream of broccoli. The recipe might have just needed a base slightly more flavorful than water. If I ever try and cross this bridge again, I think I would try store-bought veggie stock or, better yet, use the chicken broth the recipe actually calls for. Chicken broth would give it saltiness and richness without overpowering the rest of the soup. 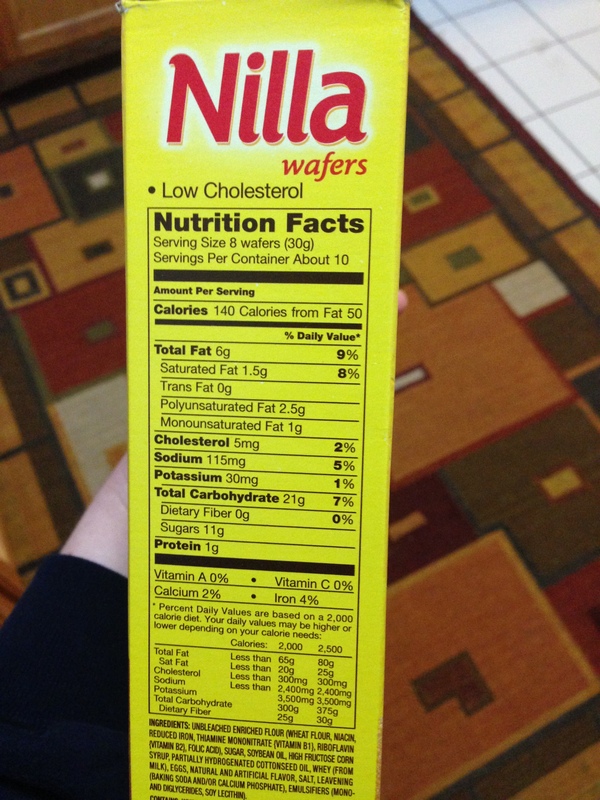 I have to disagree with the reduced-sodium idea, though. This recipe needs salt badly. 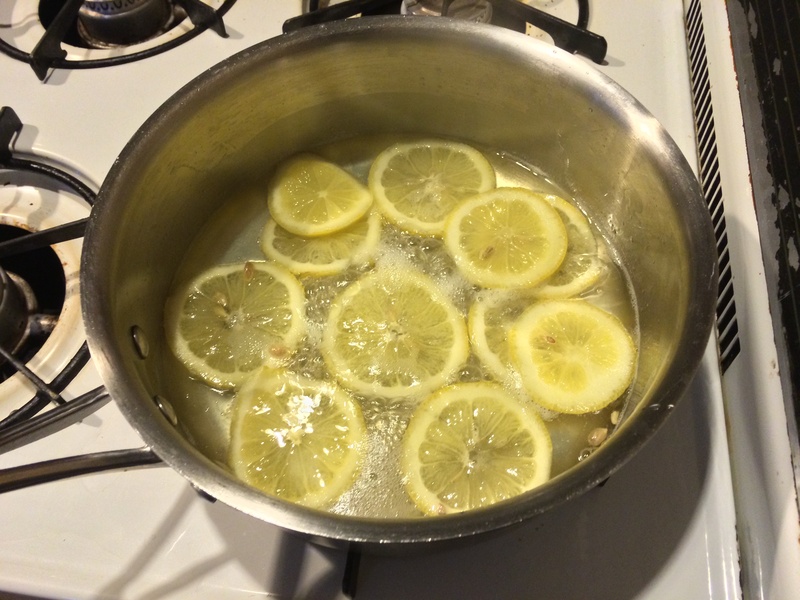 Theory 2: There is too much lemon juice in this recipe. The recipe calls for a 1/4 cup of lemon juice. Before the lemon juice went it, this was a lackluster soup with an off-putting earthiness that probably needed a ton more salt (and some cheese). After the lemon juice? Shudder. It tasted like sour broccoli blended with milk and heated up, which, come to think of it, was pretty much true. A quick squeeze of lemon juice might have brightened this dish up a little, but 1/4 cup was far too much. All that wasn’t enough to make me throw it out. I threw it out because we forgot about it after dinner and left it on the stovetop over night. I’m kind of a food safety nut (a food safety nut who eats cookie dough, so that’s the glass house from which I throw all of my rocks). I didn’t think it was safe to eat a cream soup that sat out for 12 hours. Boo hoo. Off to the trash, sour soup! It was the rare Everyday Food bust.